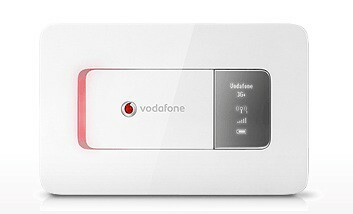 Vodafone has launched an own-branded mobile Wi-Fi solution. It has taken Vodafone around a year to follow 3’s lead, and in doing so it becomes the second UK network operator to offer mobile broadband with Wi-Fi in a dongle. Vodafone has launched an own-branded mobile Wi-Fi solution. It has taken Vodafone around a year to follow 3’s lead, and in doing so it becomes the second UK network operator to offer mobile broadband with Wi-Fi in a dongle. In the intervening time 3 has relaunched its so-called MiFi device as a sleeker, slimmer device than it was at the outset. Vodafone’s offering, which like 3’s is made by Huawei, is a thin, sleek white offering, much like its white mobile broadband dongles, though rather larger at 90 x 60 x 12mm and 90g in weight. Vodafone’s Mobile Wi-Fi unit supports up to five devices and can handle 7.2Mbps download speeds and 5.76Mbps upload speeds. Vodafone says the unit is good for up to four hours of online time with the maximum of five devices connected, and will last for 100 hours on standby. The device can be charged from the mains or via USB. There is a microSD card slot on the device. There currently three tariffs on offer. For £25 a month you get 5GB of data and a free Mobile Wi-Fi unit. For £15 a month you get 3GB of data a month and pay £49 for the unit. If you want 4GB of data a month then there is a £20 plan on which the device costs £29. These are all 18 month contracts. By comparison 3’s MiFi is available on several tariffs including for £49.99 on Pay As You Go and from £39.99 on pay monthly £15 a month rolling contract with 5GB of data per month.